Available in blue & red or yellow & black. Bi-Ply Window Panels. Bi-Ply has the visibility and firmness of monofilm, but lasts three times longer, for multiple reasons. Our 6 mil Bi-Ply is made from 2 layers of 3 mil film, laminated together with glue containing a UV inhibitor which greatly extends the life of the film. By being made from 2 thinner layers, the material is more flexible, stays more supple longer and offers much more resistance to the creasing and eventual breaking that monofilm can suffer. This is really big news as it is a material that offers a more durable alternative to monofilm, with the same perfect clarity. All Goya films, including Scrim, Bi-Ply and X-Ply are made in the USA by Dimension Polyant ® to the highest standards of sail cloth technology. What this means is supreme quality control and film consistency. Hybrid dacron/scrim luff panels, Carbon Stretch Control, Poly Clew Titanium Clew Rings, Rip Stop Sleeve and a Molded Tack Fairing round off the peak quality package. Sleeve cut treatments as well as tack and foot reinforcements are now folded to increase durability and prevent edge fraying. A wider scalloped upper leech reinforcement prevents breakdown of the leech from fluttering in strong wind conditions such as Omaezaki, the Gorge and Pozo. I am absolutely loved in this sail from the first touch. 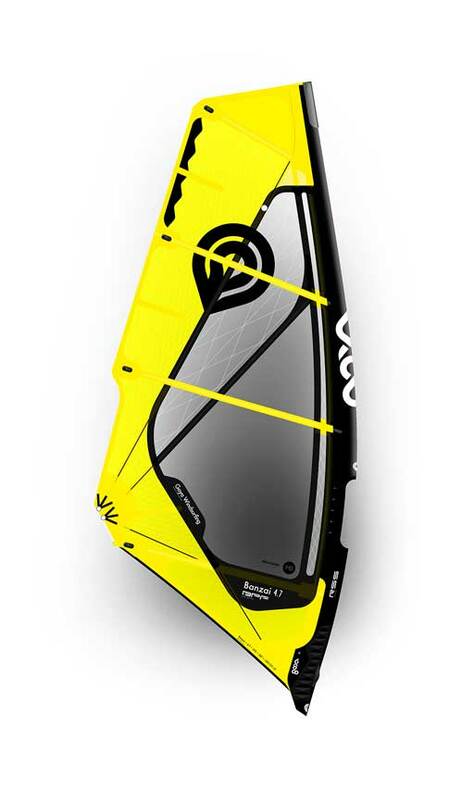 Recently I took 4.7 Banzai with Goya mast 90% and I am amazed how powerful and easy to ride with the wind between 25-40 kn and bump and jump conditions. Very easy to calm down when overpowered, exceptional in a power jibe, precise and easy to switch. Very fast, but fully controllable all the time. Best sail I used till now. Thank you guys a lot, I really fealt the passion you embedded in this sail. The Banzai is an extremely powerful sail. I was really surprised by how much power it gives the first time I used it. It is still light, not a heavy sail as you would expect from a 4 batten sail. It always rig well. It has a big range, you can stand it even with very strong wind. Overall, a great sail. Just great feedback for the Banzais and Fringes, Banzais feeling a bit softer (due to decreased mast length I guess) and the Fringes more stable and therefore having a bigger range. I'm absolutely happy with my new Banzais 4.2 & 5.3, that replace my old sails (3.7, 4.2., 4.7 & 5.3) because the trimm possibilities. I proved yesterday in Denmark with a lot of wind my old 3.7 but my 4.2 ist better. Now i can sail with 2 sails and 2 masts to replace my old 4 sails with 3 masts. Amazing sails, lot of power but very easy to handle and esthetically a masterwork, beautiful colors in great combination, nice details and top-quality-material. Just thought I'd like to let you know I am really enjoying the new sail. Its performance is truly amazing and we have had a couple of good sessions lately. Tried the Cube 85 and the 5.0 (jason it’s incredible nice and smooth) in my home spot in Venice. 5 years with Banzai and you did the Magic again. 2016 is the best Banzai you have made so far. Tried the 4.5 yesterday in very gusty and demanding conditions. From 10ms to like 15/16 ms.
Dead onshore to cross offshore in just one session. The sail just felt right in the hands from first seconds on the water. Crisp, fast, with good power and easy depower - when on the wave. It feels like a Banzai 2014 version with a good twist at the top end - very well done. - all 4 are over excited by the feeling of the 2016 Banzai. All the best from Denmark. Many thanks for taking the time to answer my queries, very much appreciated. By the time i sent the email through Goya website i noticed that the Goya mast section of the website had been updated with all the information, i.e. the 99% and 70%. All is clear now and good to hear you have no intention of changing the curve, why change something which clearly works. I have the 90% in 430 and 400 …and just ordered a 370 90%…..I also believe that the 90% made in the US is way stronger than the 70% made in Italy. Sailing in breaking waves 90% is the way to go. I’m very very happy with my Banzai 2015…but couldn’t resist and pre-ordered a 5.5 2016, looks like you’ve added more dacron in luff to make it slightly softer in feel. I use both clew rings when rigging as i sail more side on shore, side shore conditions ..it gives me nice power…if a bit overpowered, i use the bottom ring …and if sailing nice side off conditions (rare) then it’s lower ring. 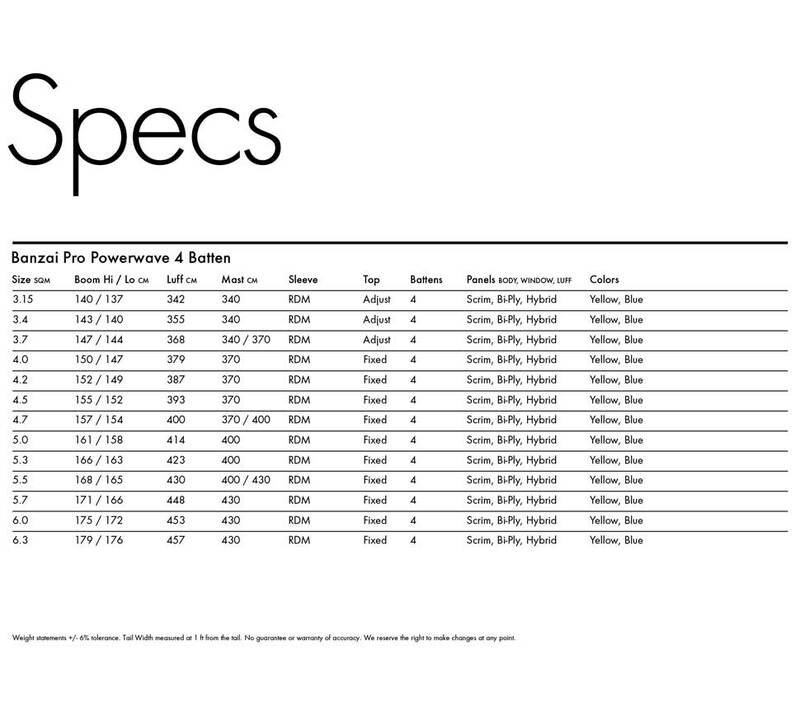 It was hard choice between 5.5 and 5.3 ..but as both rig on a 430 i went 5.5 for low end performance…the thinking here is that if using lower ring and still a handful then it’s time to go on 5.0 and it makes sail selection easier ..sometimes too much choice is no good. 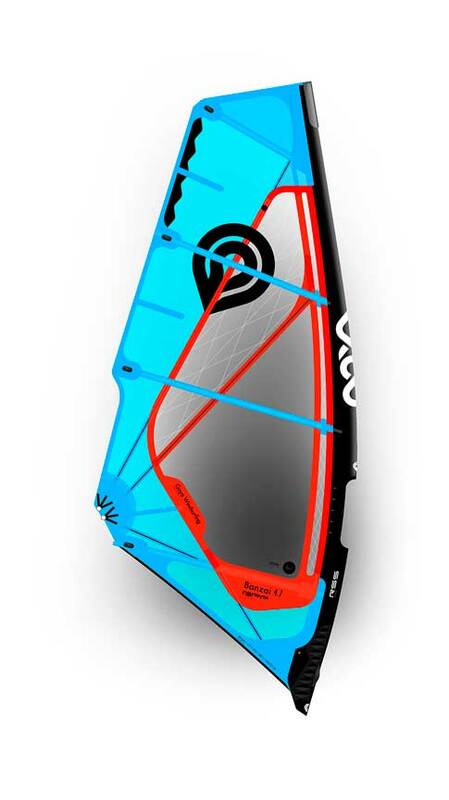 I switched brand sail earlier this year after 10 years on N.... … when I put my Banzai order in... the shop gave me a S... , so I went on a 5.3 S... on demo…had one full session on it …previously i had a few reaches on my friend ’s Banzai 4.5 and the choice was very clear….no contest Banzai was the way to go.